Several times a week I take a quick jog through the neighborhood. I have measured off a 1 ½ mile loop that takes me around a few adjoining streets and back to my home. One particular day as I was rounding a corner something unusual occurred: a neighbor flagged me down. Now I had never spoken to this individual before as he had recently moved into the area, but his exaggerated gyrations combined with the obvious fact that I was in the middle of a jog convinced me that an emergency had arisen. As I crossed the street, I mentally reviewed the CPR steps that I had learned in my first aid class and prepared myself for the citizen’s bravery award I was certain to receive. Instead the man introduced himself, shook my hand, and asked if I was in the military. While flattered to be mistaken for someone bravely serving our country, I made a quick mental note to tell my barber not to cut my hair so short and replied that I was a computer technician. He seemed momentarily perplexed by this until he said, “Oh, you must be training for a 5K.” I quickly replied that I had no desire to run a 5K and was not really training for anything. Apparently unable to resolve these conflicting pieces of information, he looked at me and asked, “Then what are you running for?” Incredibly, I was unable to produce a single, logical explanation for my behavior and I came embarrassingly close to apologizing for having the audacity to exercise without defined goals or expectations. I quickly snapped out of it and realized that spending too much time with this guy might cause me to question the reason I continue to get up in the morning. Now feeling as if I was bargaining for a used car, I made a conspicuous motion to place my headphones back on my ears and continue my purposeless jogging. Sensing it was time to bring out the big guns, he motions toward his home and says, “As you can see, I am doing pretty well for myself and you could have all of this by committing to the army.” I almost reminded him that we live six houses apart from each other, but I feared that any rebuttal would only serve to extend the conversation. Perhaps seeing that I was not sold on the idea of a career change, he asked how far I jogged. I replied that my usual route was 1 ½ miles. He quickly replied that he himself always jogged 2 miles and gave me a few encouraging words that I could “get there.” He told me to stop by any time I had any more questions and I jogged away dreaming of the day when I might be able to buy a house in my own neighborhood. I was retelling this story at a party to a friend of mine and she told me that when she was in high school she had taken the military aptitude test (ASVAB) and filled in the answers without actually reading any of the questions. The result of this was that she scored in the 98th percentile and was subsequently pursued by several recruiters. They pleaded with her at school, visited with her parents, and even took her to dinner (in other words, everything that a serious boyfriend would do) and she was understandably reluctant to admit she had simply drawn pictures with the bubbles on the answer sheet. She said it took a long time for them to back off and I told her I was pretty sure that they still had her picture up in recruiting stations across the country. I admitted that if the recruiter stopped me again I was going to offer her current whereabouts in exchange for full recruitment immunity. I actually read the questions on my ASVAB, but I think the score was so low that they pre-emptively offered me a dishonorable discharge. 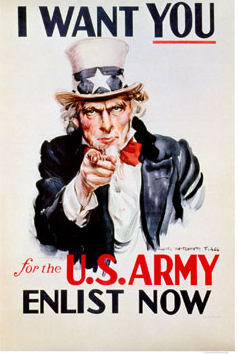 It appears that Uncle Sam wants you !